It was the my second day on Oahu and the first for some peakbagging after spending the previous day reacquainting myself with the family. They're doing fine and look pretty much like I'd last seen them, so after having breakfast with the wife I headed off for the southeast tip of the island, an hour's drive away. 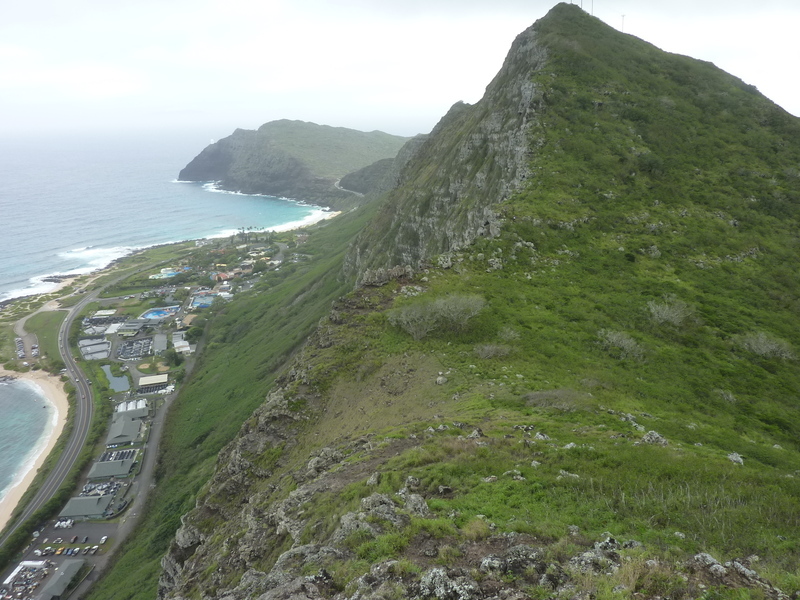 I planned to hike the southernmost stretch of the Koolau Range, about four miles' worth, starting from the Makapu'u Lookout along SR72. The TomTom Trail descends from the crest after about 3.5mi, dropping steeply to the Waimanalo neighborhood on the north side. It was named for Tom Mcguire and Tom Cadle who rediscovered this old Hawaiian trail that goes over the range between Kamiloiki Valley to Waimanalo back in the 1920s. The HTMC (Hawaiian Trail and Mountain Club) has maintained the trail for the decades since. I never made it to the TomTom portion of the trail, turning back after reaching the third summit. The start from Makapu'u Lookout is no longer open to the public and is signed in no uncertain terms, but from online reading and the condition of the trail, it appears to see regular use. Indeed, I came across two other parties on my return and as one of them commented, "it keeps most of the people out." There is a puka, or hole in the rock, found at the 1.5mi mark that seems to be the destination most parties are after. Though mildly interesting, I didn't think it soley worth the effort. The far better reason to do the hike is the amazing views along the sheer cliffs that the trail passes at the edge of. The trail is described as 4mi, 6.6mi and other lengths, mostly depending on who does the reporting and how far they went. The Koolau Summit Trail spans the entire length of the range, some 40 miles worth, so it's really up to you, how long you want to hike and how much effort you want to expend. I started my hike around 8:45a, not an early start, but earlier than most of the folks that come out to visit the lookout and the nearby Makapu'u Point Lighthouse Trail. The latter is exceedingly popular and draws large crowds for the privilege of hiking a few miles on a paved road closed to vehicles. While the "trail" is nothing to write home about, the views off the coast are, and it is these that attracts folks. I was a little nervous passing the No Trespassing signs installed along the highway but no one stopped to shout at me or otherwise take notice. In five minutes I was out of view of the roadway and relaxed once again. I had seen some online photos showing people scrambling over the chainlink netting installed to keep rocks from falling on the highway. It turns out one needn't do this at all unless you're looking for some sort of glory shot like the guys who took it. The more regular trail follows well to the south of the fencing, zigzagging up the slope until it meets the crest after those first five minutes. There's plenty of hiking along the cliffs' edge to be had, so I see no reason to go out of the way for more, especially where it's easily in view from the highway. The ridge climbs up to the first of three unnamed summits, Peak 909ft in the first mile. It overlooks the developed community of Kalama Valley on the south side - this is what all of Hawaii would look like if it were in Los Angles or San Diego. On the northeast side one looks down to the coast and Sea Life Park, almost from overhead. I could see dolpins and other marine animals swimming in the collection of pools along with other attractions - it sort of looks like a poor cousin to Sea World. A steep, 20min descent from the summit to the north gets one to the puka found at the saddle below. The hole is about 3-4ft across and hard to miss. You can find dozens of online photos taken of it, most showing the small off-shore island of Kaohikaipu through the hole, often with someone sitting or posing above it, mostly over-hyped, I thought. The trail continues along the crest, climbing to a benchmark at 1,251ft in about half a mile. From here you can look down on a collection of buildings known as Winners Camp, just on the south side of the crest. It's mostly a youth leadership camp offering ropes courses and other things one might find at a Scout camp. I didn't know this until later the same evening, and though I saw no one outside the 4 acre complex, I saw parked vehicles and approached with what was probably unnecessary caution. Just past this is an old military installation with much leftover stuff, much of it sprayed with graffiti and left to be consumed by the rain forest. Not all is abandoned, however, as there are numerous telecom installations at several sites. The trail passes through some forest sections here before emerging at a rusting BBQ where the paved access road is found. One hikes a short distance up the road before encountering a gate (ominously open, and half a dozen trucks parked at various locations inside). The trail continues to the left of the road just before the gate and then skirts the fenced complex on it's south side. As I was passing along the fence perimeter I came across a young technician on the other side of the fence who'd snuck outside to have a smoke. We awkwardly acknowledged the other with a half-wave, then continued on without having exchanged a word. Inside the fenced compound is found the second summit, Peak 1,380ft with almost 500ft of prominence. It seemed foolish to try to reach it by going in through the gate as I would have had to walk by a number of the trucks inside. I found on my way back that the highpoint can be reached from the north side via a spur trail that goes around the northeast edge of the fence. Large parts of the fence are missing here and the cliff is very close at hand - it was probably the diciest bit of cliff-edge walking I found, though not all that dicey. It leads to a concrete platform at the highpoint next to the tallest of the telecom towers. I imagine there can be pretty nice views from here when the weather is clear, but most of the terrain above 1,000ft was in the clouds and views were only marginal this morning.